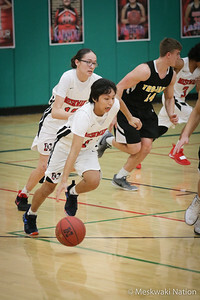 The Meskwaki Warriors hosted the West Marshall Trojans for a boy/girl non-conference doubleheader on Monday, February 4. The evening was also Senior Night for all MSS winter activities. Nine seniors and their families were honored and presented with gift baskets between the boys and the girls varsity games. 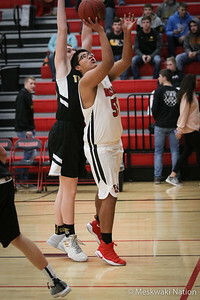 Seniors included: (Girls Basketball): Leticia Garcia, Abigail Iron Shell, Tori Lasley, Danielle Seymour, Marley Whitefish; (Cheerleading): Tracie Kapayou; (Boys Basketball): Tate' Bear, Ellis Lasley, and Noah Seymour. 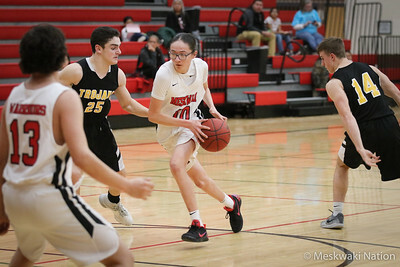 In varsity competition, the 1A Warriors (10-8) took on a 3A Trojans team (11-6) who were Regional finalists in 2018 and have spent time in the Class 3A girls rankings at periods throughout the season with only one loss against an unranked opponent. 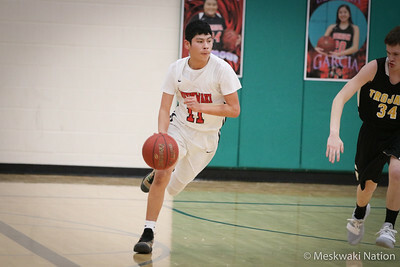 Meskwaki meanwhile, are in third place in a competitive Iowa Star South conference and have played several close games against ranked teams this season and were looking to build some momentum heading into their postseason regional bracket. 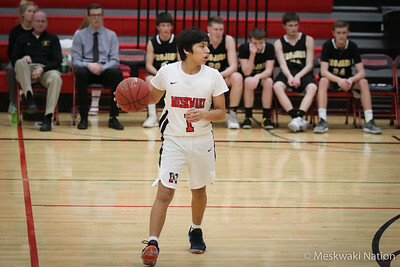 West Marshall was able to get out to an 11 point lead in the first half and kept their foot on the gas through all four quarters, leading to a 56-33 West Marshall win. 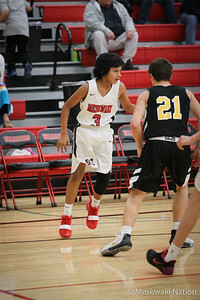 Junior Payton Tahahwah led the Warriors with 12 points along with six rebounds. 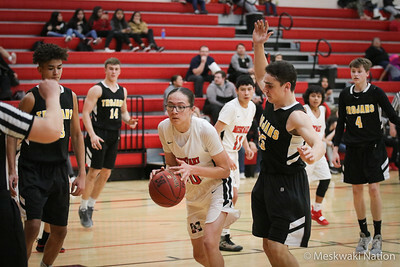 Sophomore Deandra Navarro chipped in 11 points and ended up with a well-rounded performance, including shooting 2-6 from three point range, 3-5 from the free throw line, two rebounds, two assists, and two steals. Senior Abigail Iron Shell finished with eight points on the night but led the team with three steals. Senior Tori Lasley once again led the Warriors in the post, crashing the boards for seven rebounds along with six blocks. 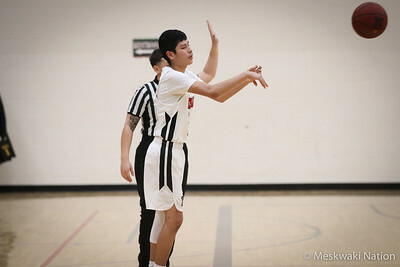 Lasley’s six blocks builds on what has been an impressive campaign by the 6-foot senior. 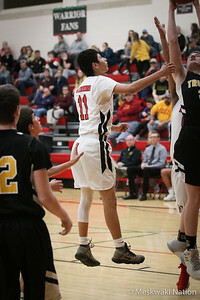 Lasley currently ranks fourth in all of Class 1A (ninth in the state) with 70 blocks on the season. 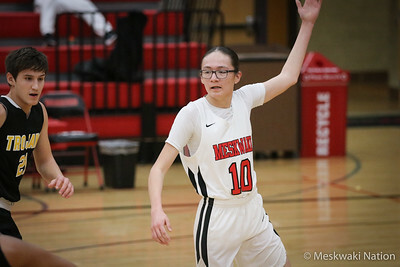 Earlier this season, Lasley broke the MSS career blocks record, which was previously held by Grace Tahahwah (2017) who finished her career with 154. So far, Lasley has amassed 171 career blocks in her four seasons with the Warriors. 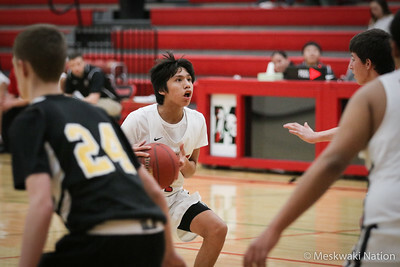 After Senior Night festivities concluded, the Meskwaki boys team (12-5 and leaders of the Iowa Star South) took the court against West Marshall (13-6 and leaders of the NICL West). The two conference leaders kept the game close through all four quarters. 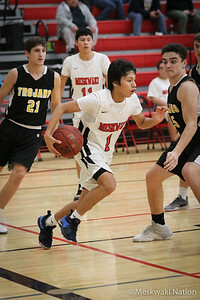 The Warriors went into halftime with a three point lead but the Trojans pushed back in the third quarter, outscoring the Warriors by three points going into the fourth. 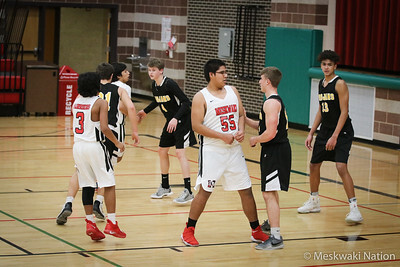 The Warriors got down by as many as ten points during the fourth quarter but came storming back in the final minutes. 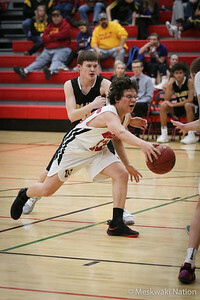 Then, with under ten seconds left in the game, senior Tate' Bear scored a walk off three-point play to put the stamp on a statement win for the Warriors on Senior Night. 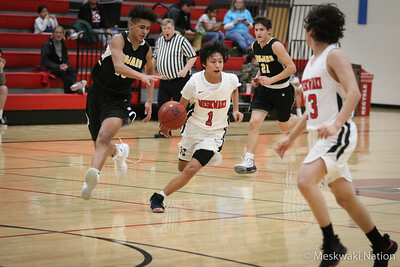 The final score after four quarters of thrilling basketball was Meskwaki 71, West Marshall 70. 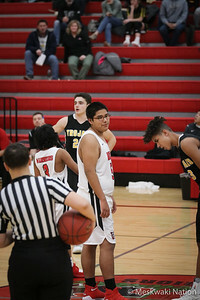 Bear finished as the game’s leading scorer while also etching his name into the Meskwaki Settlement School history books. 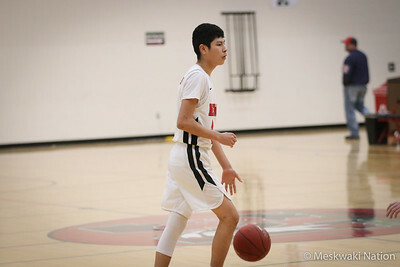 The senior’s 29 points on Monday pushed his career total to 1302 points (and counting), making him the school’s all time scoring leader. 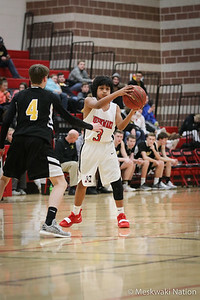 Previous record holders include Royce Timberwolf (2011-2015, 1055 points), Allis Tahahwah (2012-2016, 1081 points), and most recently Jarius Bear (2014-2018, 1291 points). 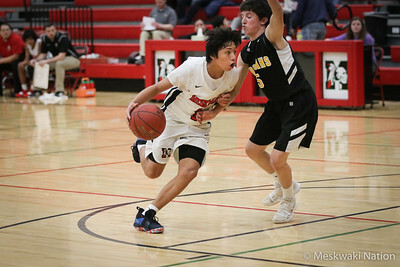 Additionally, Bear’s 22.8 points per game average is 7th best in all of Class 1A. 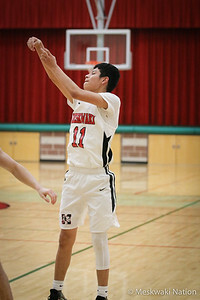 On Monday the Warriors were led by Bear whose 29 points came from 64% shooting from the field. He also nearly got a triple-double finishing with 10 rebounds, six assists, and one block. 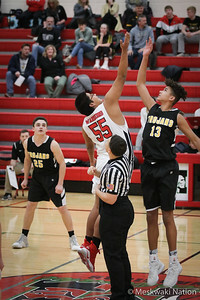 Sophomore Tiernan Wanatee was next for the Warriors with 12 points, four rebounds, two assists, and one block. 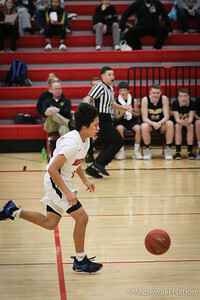 Senior Noah Seymour came off the bench and provided his team with 10 points and some size and length to compete down low. 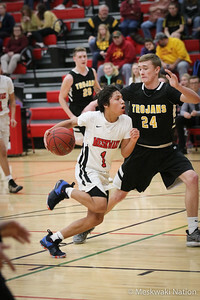 Sophomore guards Evan Nelson and Taurice Grant each finished with eight points. 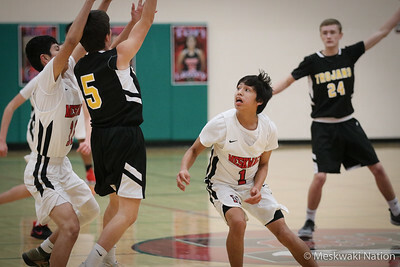 Nelson shot two of the Warriors’ five three pointers while Grant led the team with nine assists and three steals. 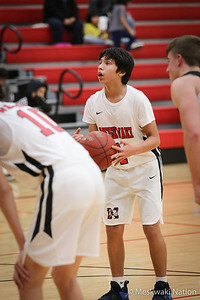 Freshman Larnell Velaquez rounded out the Warriors scorers with four points that came at a crucial moment late in the fourth quarter.